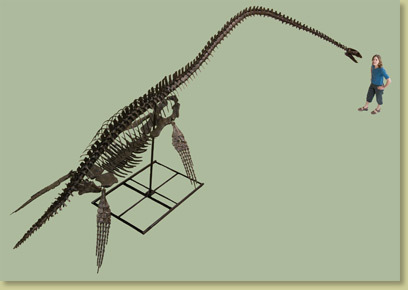 The long necked Elasmosaurus has been found in Cretaceous marine sediments on almost every continent. Although few skulls of this marine reptile have been found, enough partial and fragmentary skulls have been discovered, to give a pretty complete look of the features of this elegant sea monster. Its small head, with very sharp teeth, was attached to a long neck with up to 70 vertebrae that made up two-thirds of its overall length! Coprolite specimens collected with Elasmosaurus contain crabs and mollusks, it’s teeth were most adapted to a diet of fish. Polished rocks called “gastroliths” have been found in the belly region of most Elasmosaurus specimens. These could have aided in digestion but were most likely present as ballast for deep dives. Mike Trask and his daughter Heather discovered the PUNTLEDGE RIVER Elasmosaurus under 12 feet (3.7 m) of solid shale off the Puntlege River near Courtenay, British Columbia on November 12, 1988. forty volunteers worked for three months under the direction of Dr. Rolf Luvigson to carefully extract this leviathan from its weighty grave. Although the poorly preserved skull makes exact identification impossible, this is the first Elasmosaur found west of the Rockies. Dr. Elizabeth Nicholls of the Royal Tyrrell Museum presided over identification and preparation. Elasmosaurus is the perfect addition to any Cretaceous marine exhibit. Credit Original fossil on display at Courtenay and District Museum and Paleontology Center in Courtenay, British Columbia, Canada. Notes May take approximately 6 months for production. Check with us to see if an earlier date is possible. Extras Additional crating and packing charges may apply.